In parts 12 and 13, we have seen joining 2 different tables - tblEmployees and tblDepartments. Have you ever thought of a need to join a table with itself. Consider tblEmployees table shown below. Write a query which gives the following result. A MANAGER is also an EMPLOYEE. Both the, EMPLOYEE and MANAGER rows, are present in the same table. Here we are joining tblEmployee with itself using different alias names, E for Employee and M for Manager. We are using LEFT JOIN, to get the rows with ManagerId NULL. You can see in the output TODD's record is also retrieved, but the MANAGER is NULL. If you replace LEFT JOIN with INNER JOIN, you will not get TODD's record. In short, joining a table with itself is called as SELF JOIN. SELF JOIN is not a different type of JOIN. It can be classified under any type of JOIN - INNER, OUTER or CROSS Joins. The above query is, LEFT OUTER SELF Join. Hi Madhu, very good question. No it's not mandatory. Even without these relationships you should be able to perform joins without any issues. How can we join two tables without any primary key/Foreign key? It is possible, try creating 2 tables without defining table relationship, enter data and execute the query as long as the relationship matches. Venkat Sir, your videos are very useful. hats off to you for uploading the content for free (for us) in Youtube. Not everyone does that in India. I came across your tutorials on YouTube and they are by far the best and thus thank you. I have a question. I'm working with a client data base and am doing a left join between admission and most recent. However I striving to exclude all encounters between admission and recent and am stuck. Any suggestions? i didn't get the meaning between admission and most recent. But i believe the above query should work (after using the proper table and field names). What if I don't want to allow join for a table? Hi Venkat, your videos are very useful. hats off to you for uploading the content for free (for us) in Youtube. Hi Venkat ,can you please give real time example of cross -join? It would be very helpful for my understanding if some one can explain. 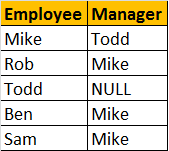 We have only ManagerID in the Employee table and the Manager Name is in a different table which is not in the example above. 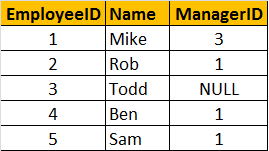 In that case, why need to do a self join with employee table, as we can do a join with that Manager information table which also produce the desired result if we write a query selecting the desired columns for the output.